We have an exciting job opportunity for a preschool manager to join the Lantern staff team. Click here for more details on how you can apply. S-ZONE is our new once a month family service. See the flyer below for further details. Redland is currently looking for a new Lead Youth Worker, who we hope will join us in January 2019. Full details are available here – the closing date is Sunday 18th November. We’ll be welcoming visitors to the Church and Churchyard and offering refreshments in the foyer of our halls. Come and find out about what happened in the past, and what’s happening now in this wonderful Georgian building. Click here for photos of what you can expect to see when you visit. Storytellers, to bring our building and surroundings alive. A year in the life of Redland Parish Church. Redland Education Centre is looking for a talented and well organised Christian teacher to assist with its work in schools for 1 or 2 days a week. Full details and job description and application form can be found here. This year at Redland we are really excited about a number of new things that we would love to share with you! Since the new halls were opened, we have enjoyed the easier access, the scope for more creative and flexible worship and the opportunities for creating community that they have offered at our monthly family service – and now we are enjoying these facilities on all the other Sundays, having moved our 10am service across to the halls as well. Our re-launched 10am service includes refreshments served from 9:30am, and we then the whole church family joins together for the start of our service. The children leave for their different activities after the first 15 minutes – we have groups for anyone aged 3-13 in the morning, as well as a crèche area at the back of the building for little ones and their parents. The service continues with a time of worship, prayer and teaching which focuses on how our faith makes a difference on our lives. Once a month we share communion, and the children re-join us for this too. After the service we offer prayer ministry as well as more refreshments and a chance to spend time together. 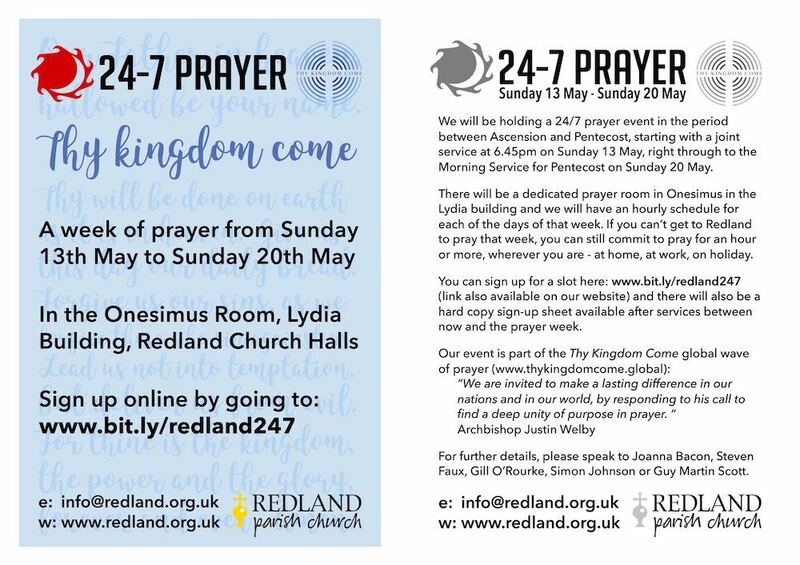 Another change at Redland this year is in our monthly bulletin. We have designed a new vibrant and bright bulletin for the month ahead, with all the key dates and big events in it. We hope that it gives newcomers a feel for what we are about as a church, as well as providing church members with all the information they need for the coming weeks. Thirdly, if you are reading this, you have found yourself on our new website! We are really pleased by the new layout and design which we hope you will be able to navigate easily, find out more about the life of the church, our vision for the future and enquire about hall bookings. Our new website means that we can keep you even more up-to-date with what’s going on, so keep visiting us for all the latest news from Redland! On November 17th, we are really excited that Riding Lights theatre company will be visiting Redland for a production of ‘Gospel Street’. It’s going to be a great chance for entertainment, and to hear the Christian message – bring your friends and come along!